The Force is the ultimate tool for developing speed and power via resistance training. This Sport Loading Platform provides coaches and trainers with a controlled atmosphere from which to develop lower extremity output, increase stride length and increase overall explosiveness with measureable results for their athletes. Please call 01926 813916 for Woodway pricing and delivery lead times. Based on WOODWAY’s patented slat and ball bearing design, the Force does not have a drive motor, but actually a magnetic braking system (0-150 lb.) that turns the athlete/user into “the force” which drives the belt. 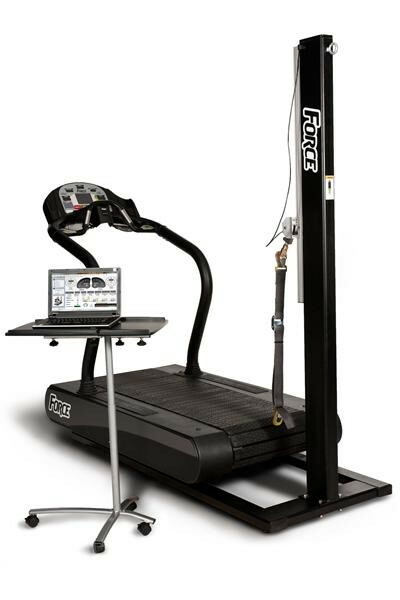 The Force works by tethering the athlete to the rear of the treadmill and having them actually spin the belt as they run; adding resistance increases the force that the athlete must generate to run. The Force 3.0 includes four individual vertical load cells under the running surface and a horizontal load cell attached to the vertical strut and Force software that allows the Conditioner to measure power output and graph power, speed, stride length, stride rate(cadence), symmetry between sucessive strides, heart rate and distance against time to track the athletes progress and produce measureable results as well as allow Gait analysis for sport-specific research.